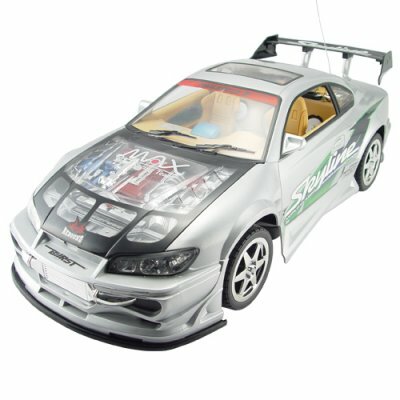 Successfully Added Radio Control Drifting RC Toy Super Racing Car (220V) to your Shopping Cart. Radio Control Drifting RC Toy Super Racing Car for white knuckle racing and professional drifting excitement. This RC racing machine really makes a powerful statement with its 1:10 size ratio versus the real thing. Real street and drift racing fans will recognize its pedigree and fall in love with this RC toy immediately. Painted like a silver ghost, it features a performance spoiler for extra speed and a transparent hood so you can admire all those roaring ponies underneath. But diehard race enthusiasts will really go crazy for the attention to racing this beauty brings to the table. Notice how the back seats have been removed for two big silver-colored tanks. That's nitrous oxide commonly known as NOS, for that extra punch when the other racers are breathing down your neck. Raise your eyes and notice that two inline power amps and three huge subwoofers. Finally, if you really pay attention you'll see the metal racing pedals by the driver's foot which no street racer would be caught without. This makes a cool gift for yourself or your child. After you experience how really exciting this RC Car is, then order larger quantities to re-sell. And as always, this wonderful product is offered to you at a low wholesale price direct from the leader in unique direct from China electronic products, Chinavasion. The default charger for this product is for 220V. If you need a 110V power adapter then order CVGQ-T28-110V. Practice driving in completely open and safe area until you are familiar with the controls. Can this RC super racing car be used outdoors? Yes. Can it be used outdoors after it has rained? It is not advisable as some water may get into the circuit system and damage the RC super racing car. What is the wheel adjustment for? The wheel adjustment will help you straighten the front wheels, as time can cause wear and tear. This way you get much more longer use out of this durable and amazing RC super racing car for years to come.